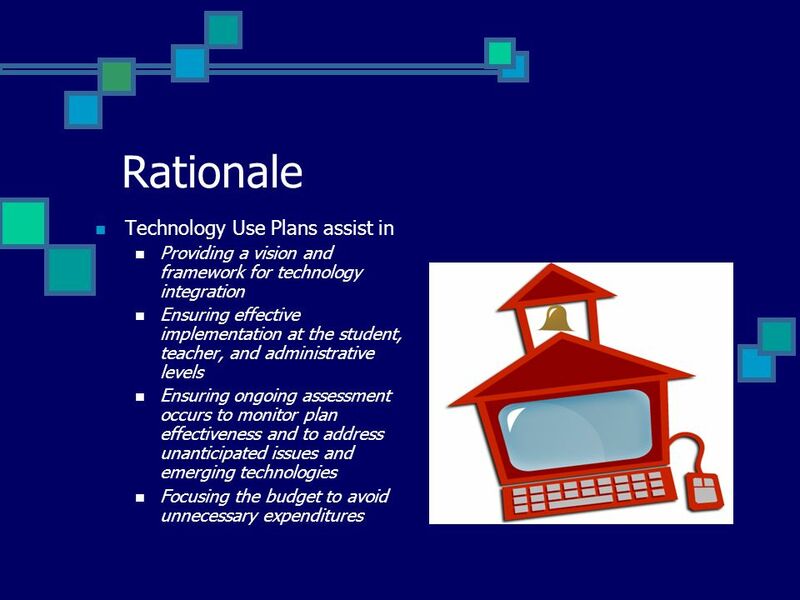 Technology Use Plan Methacton School District Patty McGinnis ED TECH 501. 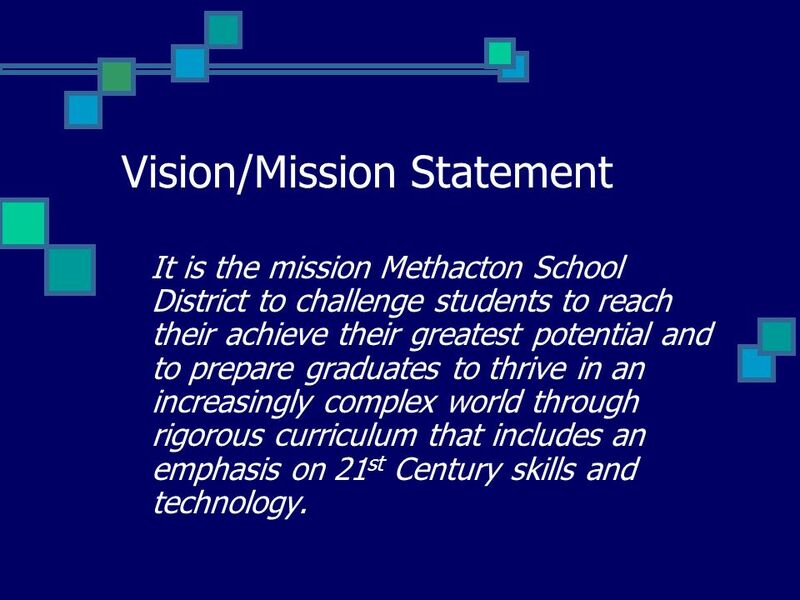 2 Vision/Mission Statement It is the mission Methacton School District to challenge students to reach their achieve their greatest potential and to prepare graduates to thrive in an increasingly complex world through rigorous curriculum that includes an emphasis on 21 st Century skills and technology. 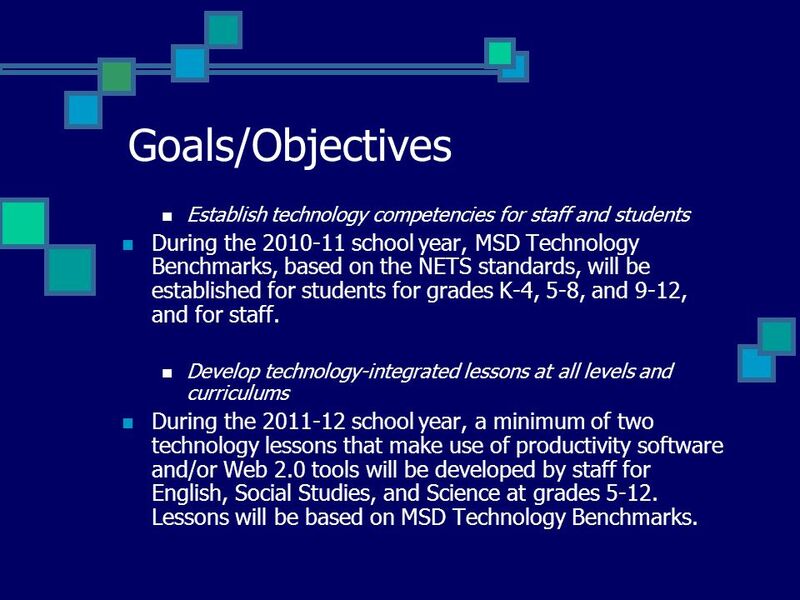 8 Goals/Objectives Establish technology competencies for staff and students During the 2010-11 school year, MSD Technology Benchmarks, based on the NETS standards, will be established for students for grades K-4, 5-8, and 9-12, and for staff. 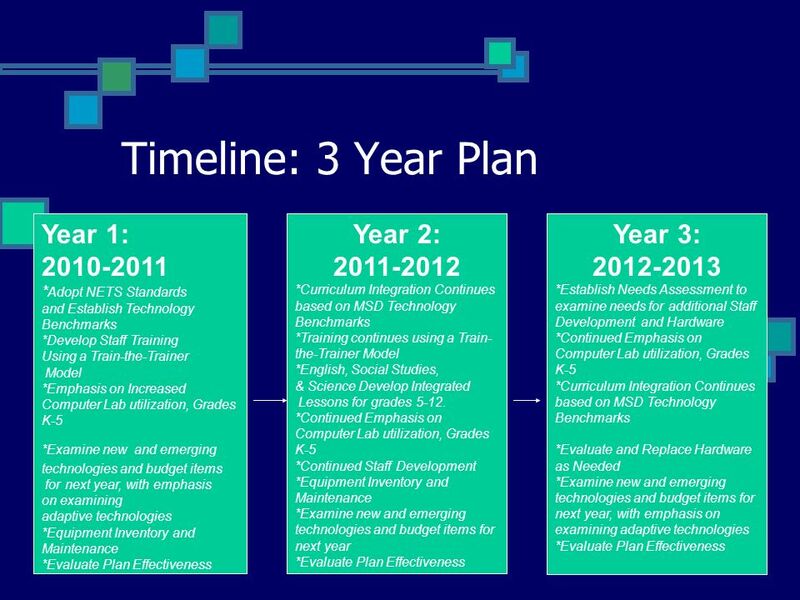 Develop technology-integrated lessons at all levels and curriculums During the 2011-12 school year, a minimum of two technology lessons that make use of productivity software and/or Web 2.0 tools will be developed by staff for English, Social Studies, and Science at grades 5-12. Lessons will be based on MSD Technology Benchmarks. 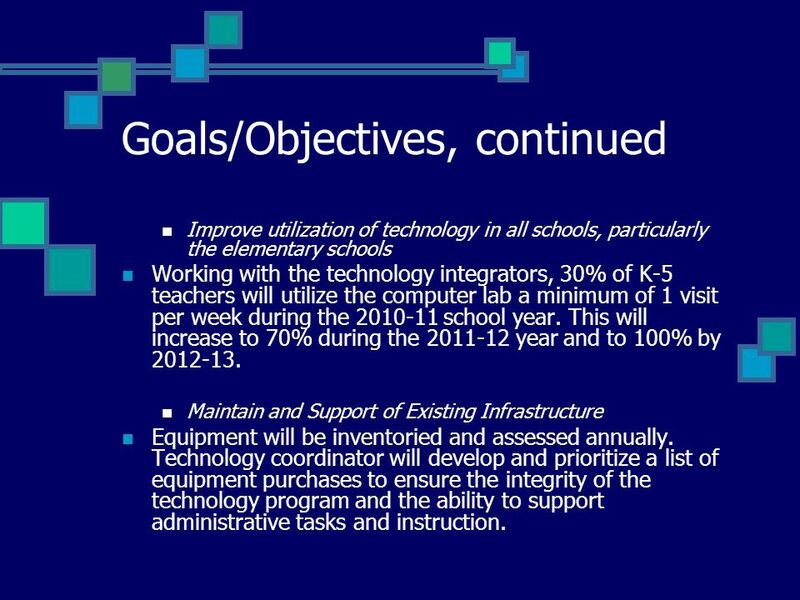 9 Goals/Objectives, continued Improve utilization of technology in all schools, particularly the elementary schools Working with the technology integrators, 30% of K-5 teachers will utilize the computer lab a minimum of 1 visit per week during the 2010-11 school year. This will increase to 70% during the 2011-12 year and to 100% by 2012-13. Maintain and Support of Existing Infrastructure Equipment will be inventoried and assessed annually. Technology coordinator will develop and prioritize a list of equipment purchases to ensure the integrity of the technology program and the ability to support administrative tasks and instruction. 10 Goals/Objectives, continued Investigate adaptive technologies for special education populations During the 2010-2011 school year, principals of each school will work with the special education teachers to will ensure that 75% of the special education population have current and/or expanded access to technology, with that figure increasing to 100% by 2012. 12 Needs Assessment Hardware questions may include: Does our present server meet our needs? Do students and staff have the storage necessary to save their documents? Are they able to access documents from home easily? Do all special education students have access to the hardware and software that they need to be successful? 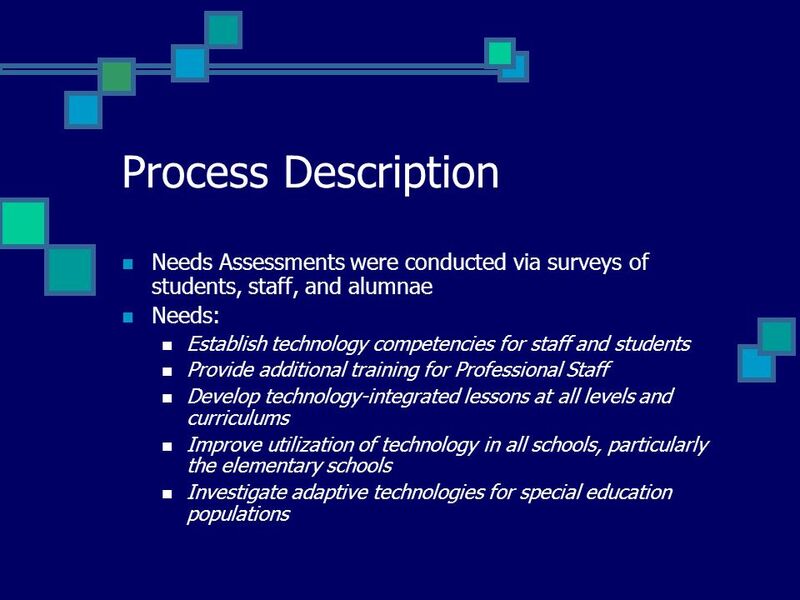 Staff will be surveyed regarding their implementation of technology into the curriculum. Questions may include: What is the average number of minutes per week that students are utilizing technology in their classrooms? On average, how many lessons per quarter involving productivity software or Web 2.0 applications do students experience? Are all lessons that utilize technology based on NETS standards? Is the staff aware of the MSD Technology Benchmarks and how they relate to their subject area or grade level? 13 Staff Development All staff will receive training in grade level performance objectives based on MSD Technology Benchmarks over a one day period. 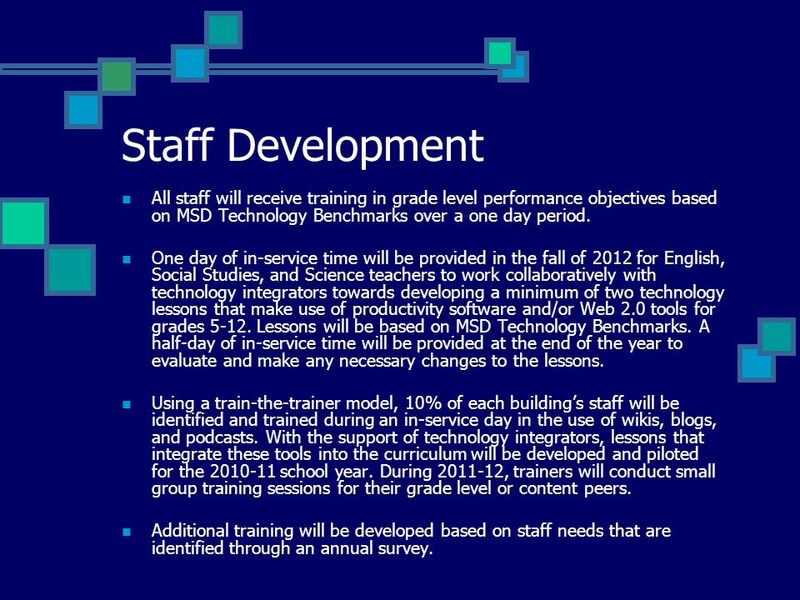 One day of in-service time will be provided in the fall of 2012 for English, Social Studies, and Science teachers to work collaboratively with technology integrators towards developing a minimum of two technology lessons that make use of productivity software and/or Web 2.0 tools for grades 5-12. 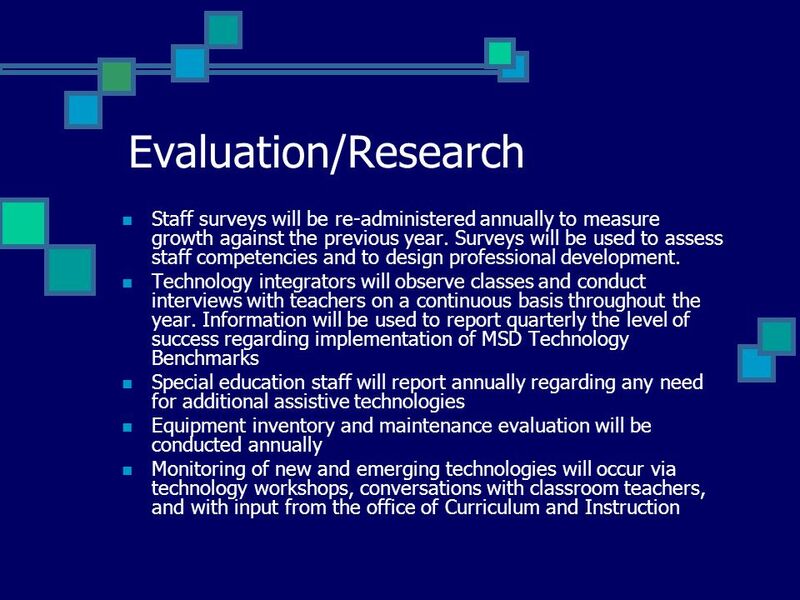 Lessons will be based on MSD Technology Benchmarks. A half-day of in-service time will be provided at the end of the year to evaluate and make any necessary changes to the lessons. Using a train-the-trainer model, 10% of each buildings staff will be identified and trained during an in-service day in the use of wikis, blogs, and podcasts. 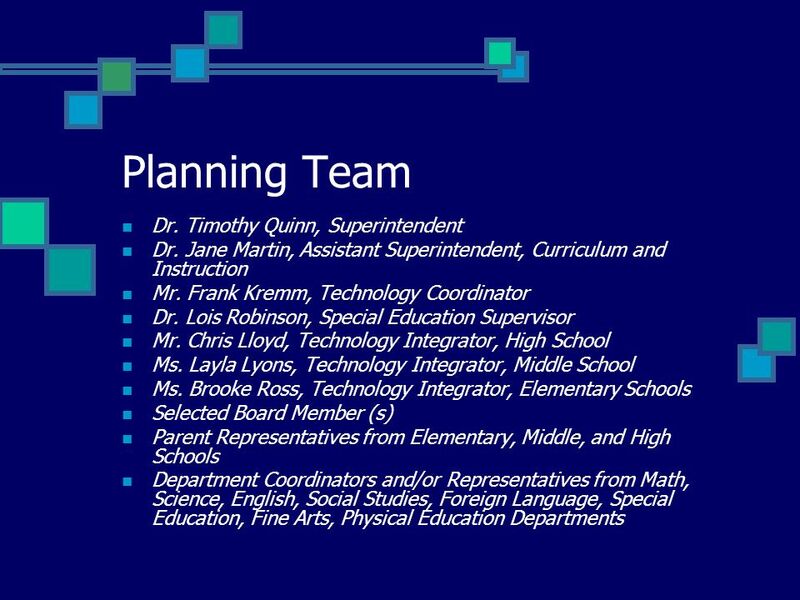 With the support of technology integrators, lessons that integrate these tools into the curriculum will be developed and piloted for the 2010-11 school year. During 2011-12, trainers will conduct small group training sessions for their grade level or content peers. Additional training will be developed based on staff needs that are identified through an annual survey. 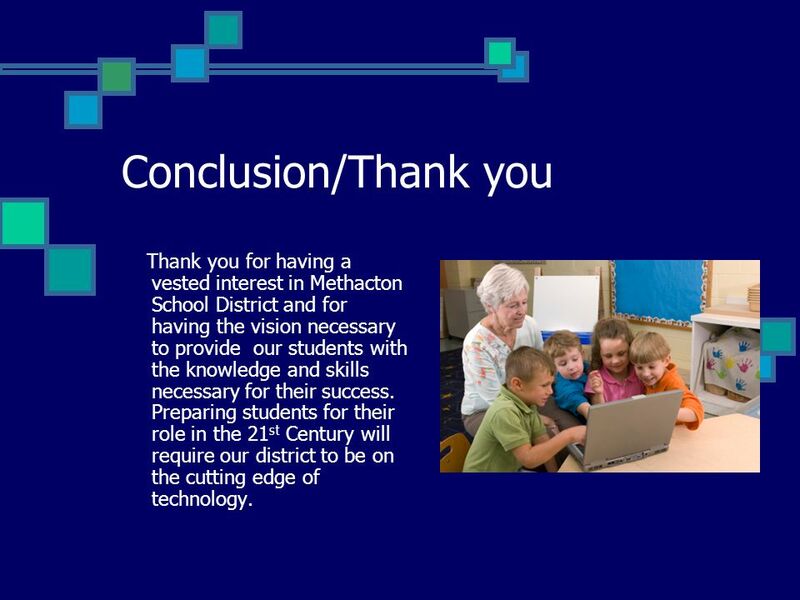 16 Conclusion/Thank you Thank you for having a vested interest in Methacton School District and for having the vision necessary to provide our students with the knowledge and skills necessary for their success. Preparing students for their role in the 21 st Century will require our district to be on the cutting edge of technology. 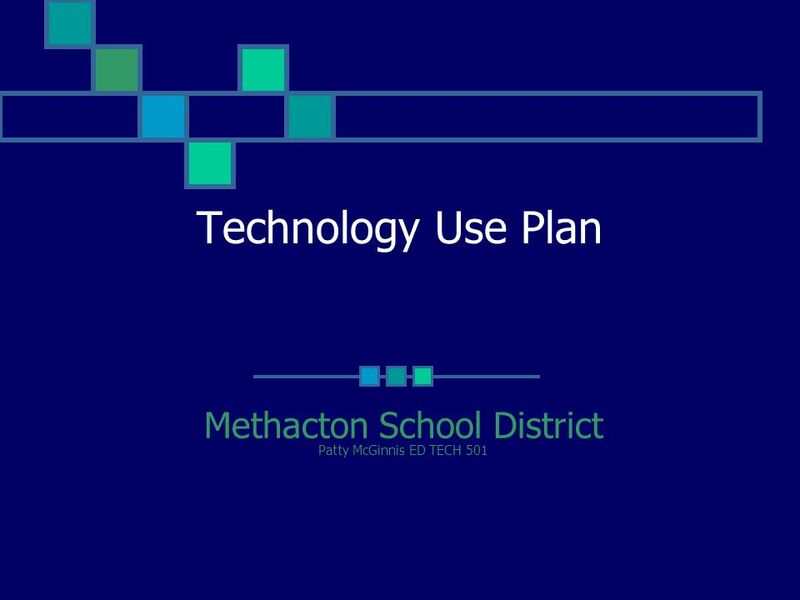 Download ppt "Technology Use Plan Methacton School District Patty McGinnis ED TECH 501." 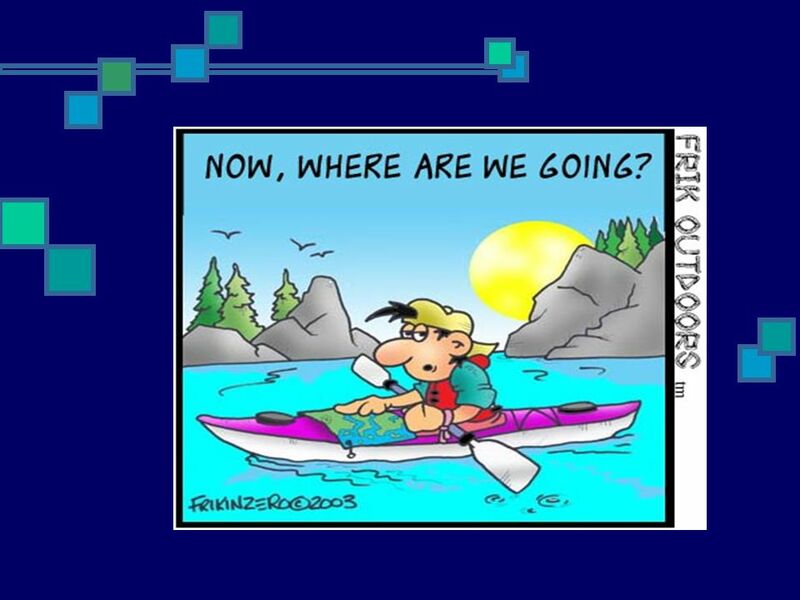 Session Objectives Begin to understand the goals, purpose and rationale for Program Reviews Learn about the components of implementing Program Reviews. Continuous Improvement Update The Integration of Continuous Improvement and Curriculum, Instruction, Assessment & Technology October 13 th, 2008. 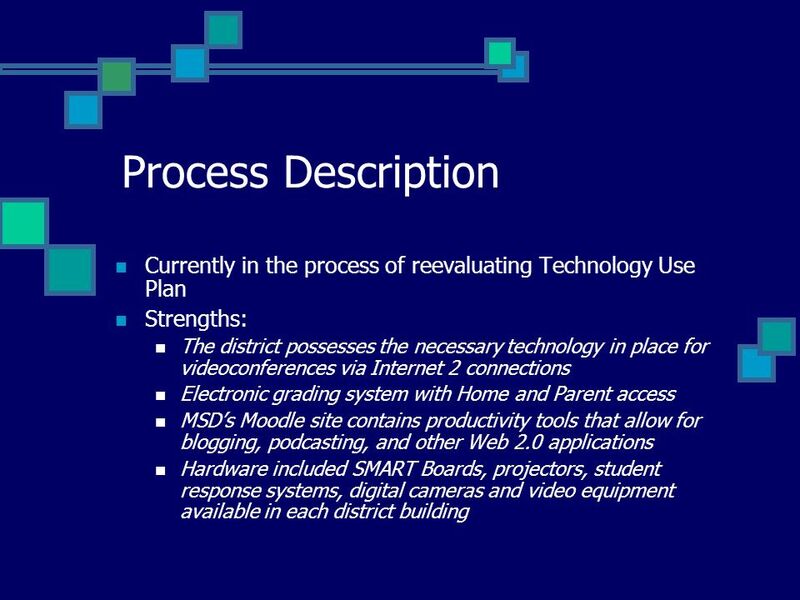 DISTRICT IMPROVEMENT PLAN Technology Domain Annual Progress Report Lakewood School District # 306. Shawboro Elementary School Home of the Mustangs School Improvement Plan Results and Next Steps October, 2009. Dennis Roche, CISA, CISM Director of Technology. How do we meet the demands of the 21 st Century Learner? 1 LAUSD Mathematics Periodic Benchmark Assessments Using Data to Inform Instruction. Norwalk – La Mirada Unified School District Common Core Implementation Plan Presented by: Dr. Lila Bronson – Assistant Superintendent of Ed. Services Shannon. “Leading for educational excellence and equity. Every day for every one.” Accountability 2.0 and the World’s Best Workforce—What Does it Mean? World’s.